Pennsylvania Supreme Court Justice David Wecht in 2015. Top Republican lawmakers have accused Wecht of bias in a gerrymandering case, saying comments he made on the campaign trail should have disqualified him from participating in the case. Top Pennsylvania Republican lawmakers are asking the Pennsylvania Supreme Court to vacate its order overturning the state's congressional district map as an unconstitutional partisan gerrymander, saying at least one justice in the case was biased. 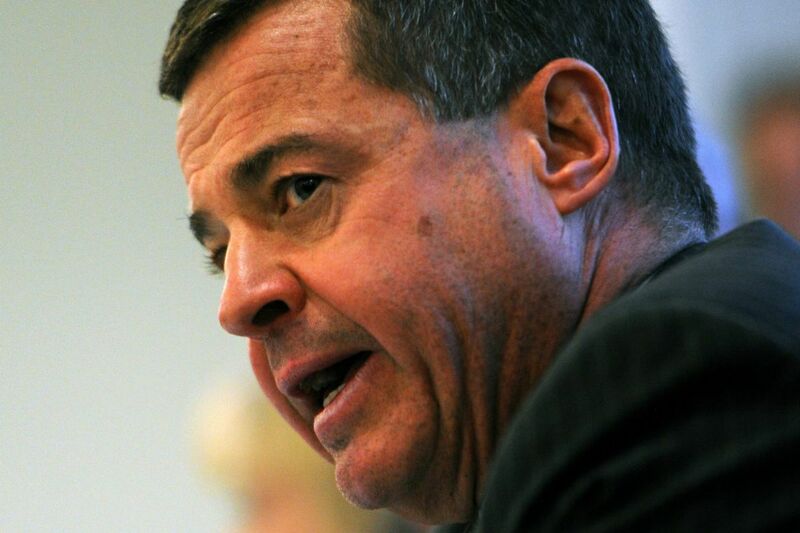 David Wecht, who was elected as a Democrat to the state high court in 2015, made several disparaging comments about the congressional map and the practice of gerrymandering while campaigning for the state Supreme Court seat. Those comments should have disqualified him from participating in the redistricting case, State Senate President Pro Tempore Joe Scarnati and House Speaker Mike Turzai said in a filing Friday. "There are a million more Democrats in this commonwealth — I want to let that sink in — a million more Democrats in this commonwealth, but there's a Republican Statehouse, there's a Republican state Senate, and there are only five Democrats in the Congress, as opposed to 13 Republicans," Wecht said in a candidate forum in 2015, according to the filing. "Think about it. Do we need a new Supreme Court? I think you know the answer." Because Wecht did not recuse himself, the Republicans said, the order should be vacated. "Justice Wecht's position regarding the 2011 plan, and, more generally, partisan map drawing were clearly defined and cemented long before this case was initiated," lawyers for Scarnati and Turzai wrote in the filing. "During his campaign to become a justice of this court and even after his election, Justice Wecht repeatedly expressed his view that the 2011 plan is unfair, unconstitutional and must be eliminated." The state Supreme Court asked the other parties in the case to file answers to the GOP request by 10:30 a.m. Monday. The high court last week threw out the state's congressional map, handing a victory to 18 Democratic voters who had challenged the map as illegally drawn to favor Republicans and discriminate against Democrats. The court ordered a new map redrawn before the primary election in May, prompting immediate criticism from Republican lawmakers who said the court was being partisan and overstepping its bounds. Days later, Republicans asked the U.S. Supreme Court for a stay in the case, saying the Pennsylvania Supreme Court is essentially legislating from the bench, taking power that the U.S. Constitution gives to state legislatures. In their filing Friday, Republicans opened a new line of attack on the court. Wecht's comments show he had already taken a position, Scarnati and Turzai said, and he should have recused himself from the League of Women Voters v. Commonwealth of Pennsylvania case. The Republicans said several court orders should be invalidated, including the one last Monday overturning the map and the one last fall that fast-tracked the case in the first place. Wecht in a 2015 campaign handout photo. Judges in Pennsylvania, including Supreme Court justices, are elected by voters. Candidates are restricted in what they are allowed to say while campaigning and are barred from making pledges or promises. They are not supposed to make comments that could be seen as affecting a judge's neutrality in a case. Wecht was one of three Democrats elected to the state Supreme Court in 2015, giving them a majority. Today, five of the justices are Democrats and two are Republicans. In the court orders in the redistricting case, Max Baer, a Democrat, joined the two Republicans in dissenting; the orders have passed on 4-3 votes. Wecht in essence provided the deciding vote, Republican lawmakers said in their filing. The Republicans said Wecht also demonstrated his bias during oral arguments last month. "In particular, Justice Wecht repeatedly referred to the 2011 plan as a 'gerrymander' (a term that has no specific meaning in this court's case law), signaling that he had already predetermined the issue," they said. In addition to going after Wecht, the lawmakers signaled they may target Christine Donohue, another Democrat elected to the state Supreme Court in 2015. They cited an article published in 2015 describing Donohue's comments at a judicial campaign forum. Wecht and Donohue explained how the Pennsylvania Supreme Court appoints the fifth and final member to the Legislative Reapportionment Commission, the group that draws the district lines, if the leaders of the state House and Senate can't agree on a selection. The state Supreme Court also reviews any challenges to the district lines drawn by the commission, meaning the court could potentially influence the process twice. Donohue said if voters selected all three Democrats on Election Day, all the court would need to do is apply the law. "And gerrymandering will come to an end," she said. That statement, the lawmakers said in the filing, calls Donohue's impartiality into question. While they are not calling for Donohue to be disqualified from the case, they are asking that she be required to disclose all information that might be relevant to a disqualification claim, including any statements she made regarding gerrymandering or the congressional map. The lawmakers said that they did not look into Wecht and Donohue until after the oral arguments, saying they presume judges to be unbiased. It was not until the hearing, when "the adversarial tone and questioning from Justices Wecht and Donohue raised doubts about the impartiality of these Justices, and possibly others," that lawyers began digging into the justices, they wrote. Parties in the case also wrote to the U.S. Supreme Court on Friday, responding to Scarnati and Turzai's request that the federal court step in to block the state court order. In separate filings, Gov. Wolf, Lt. Gov. Mike Stack, and the plaintiffs argued that the U.S. Supreme Court should not issue a stay, saying the General Assembly has enough time and guidance to draw new maps and that the state court did not overstep its bounds in its order. By Friday night, the Pennsylvania Supreme Court still had not released an opinion explaining its order. Republicans have criticized the court for the delay in releasing its order explaining why the 2011 map is unconstitutional, saying they need that explanation to serve as guidance as they draw new district boundaries. They have until next Friday to pass a new map and send it to Wolf's desk.